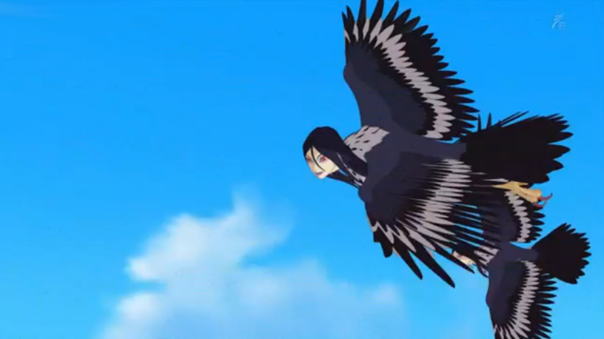 For my 100th review on Rabujoi, I sat down with my son and watched Sanzoku no Musume Ronja’s fourth episode. Frankly, it leaves me a bit muddled, reviewer wise. In some ways, this week was even prettier than the previous 3. It’s fall colors are just wonderfully vibrant and little details like dead leaves floating in the lake sell it flawlessly. The plot moves along too but, for some reason, we get two flashbacks as well and those feel entirely unnecessary. Believable? Maybe? I can understand adults would tell a child the same stories over and over again but it felt arbitrary. Like the episode needed to frame the ending scene as a cliff hanger instead of resolving it. 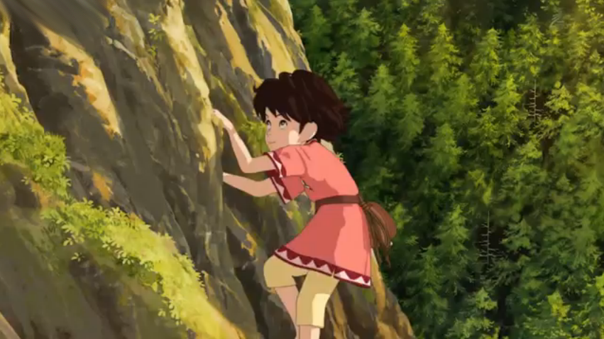 Ronja is now more familiar with her surroundings and comfortable doing all sorts of adventure — including a rock climb up her castle’s mountain base. As with previous outings, Ronja’s sense of wonder and happiness is contagious. My toddler son was absolutely glued to the laptop screen, giving me updates on what Ronja was doing and what she was feeling. Another interesting detail is how we see Ronja’s expressions emulating her father’s expressions. She yells at the harpies and squints defiantly just like him. It’s reasonably subtle but you get the sense that she’s daddy’s little girl, with very little of her mother’s common sense and community anchoring. That isn’t to say Ronja doesn’t love her mother. There’s a lovely bed time song scene that, unfortunately, had dreadful lyrics that don’t culturally translate when you’re reading them to your own child. Still, it’s a lovely scene. Then Ronja explores the castle’s guts and, eventually, encounters a boy. We’ve known this was coming since he’s shown in the ending credits, and we can assume he’s the other tribal chief’s son, but it will be interesting to see how these two get on. Honestly, I’d assumed Ronja would meet him on her own terms BUT on his turf in the forrest. Nice contextual touch that ‘the forrest has gotten too dangerous in early fall due to the harpies (mating season?). Regardless, we can expect a battle of the ‘who’s better at making terrible decisions and jumping across a gorge’ next week. As always, Ronja is lovely but you have to go into it knowing that you are watching a children’s story. It’s well produced and watchable by adults (more so than all children’s swill-shows I can think of, actually) but it is for them and not for us. If you’ve got a little one, and are willing to let them watch age appropriate anime, this is worth a little sit down. It has none of the normal moralistic shove-a-message-down-your-throat of american/british children’s TV and that’s a good thing. If you don’t have kids and want… well I don’t know what you would want from a meandering children’s tale about growing up and adventure with low stakes? It should be pretty obvious if this one isn’t for you. 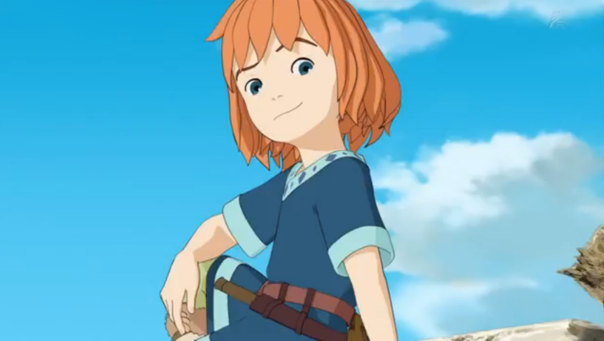 Still, even though it’s not for me, Ronja is clearly a great show. 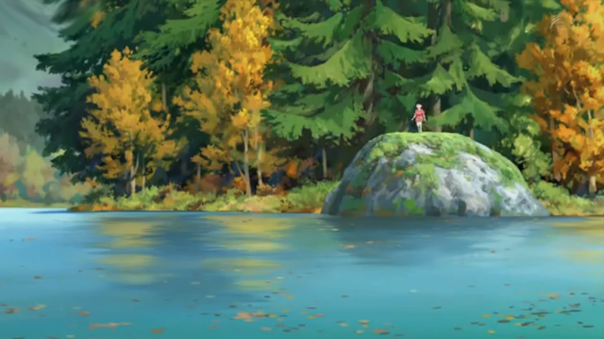 Ronja is one of my favourite books from my childhood, and I love the show very much for being so faithful to it, but I do think the pacing is a bit unfortunate. The book is only 18 chapters and they’re stretching it to 26 episodes, which means things that originally only got a mention (like the robbers rushing home to watch Ronja eat her porridge) become entire scenes. These four eps are only the first two chapters! OTOH, in a time when action scenes are added to everything whether it’s needed or not, having the action SLOWED DOWN for an adaptation makes for a nice change. And if it’s satisfying to the kids, that’s the important part. Since I haven’t seen the movie or read the book, I’d love it if you kept me in the loop on how close this matched the source material and/or if any changes are better or worse by comparison. As you said, its super enjoyable for small children and not eye clawingly pedantic like the moralistic trash I usually have to watch with them. Heck! Even Thomas the Tank engine has to shove a moral at me every 10 minute segment! Not to spoil things too much, but the connection between Ronja and Mattis and the fact that she’s “daddy’s girl” is absolutely vital to the story. So the focus on that is a positive. But the first double episodes cover a chapter of twelve and a half pages, including illustrations, so it does take a little longer in the TV show for Ronja to star in her own story. I did briefly wonder if three years is a bit young for some of the stuff that happens later, but then, kids that age watch Disney movies, which are much more distressing, so it should be fine. If all threats are as cute as the grey dwarves (horror penguins!) it’s probably not an issue. I’ll keep an eye out for scary stuff. Thanks for the heads up!